I've started a new legal technology consulting business, lawtechTalk. lawtechTalk helps you understand valuable Internet and Web 2.0 technologies and how to incorporate them into your law practice to maximize efficiency and save time and money. lawtechTalk brings the most up-to-date information directly to you through speaking engagements, webinars and personal consultations. 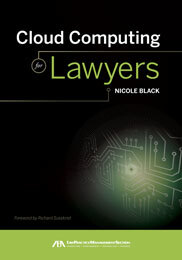 Nicole Black, a practicing attorney and legal technology enthusiast, will be your guide. Contact information and additional details about the services offered by lawtechTalk can be found here. The first episode of lawtechTalk is now available. This screencast (a recording of computer screen output along with video of me discussing what is seen) will focus on some of the best free or low cost web-based "to-do" list and reminder applications. We'll explore the main features of some of the most useful and innovative "to-do" applications to help you figure out which will best meet your needs. You can find more information about this screencast here.